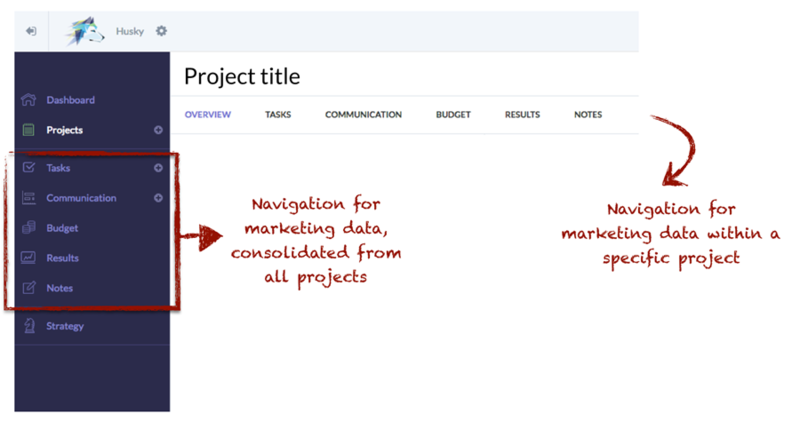 The vertical menu (dark background, on the left) provides a consolidated list of all the tasks, communication, budget, results and notes that apply to a marketing plan. This is where you will be able to get a clear overview of your marketing data in Husky. For example: how many tasks still need to be completed, what will we be communicating next week, how much of the budget have we used up or what were last month's results? The horizontal menu (right below the project name) provides a list of all the tasks, communication, budget, results and notes that apply to a specific project. Thanks to this navigation you can work on a project without being distracted by data from other projects. This is where you will be able to get a clear overview of your marketing data in Husky.